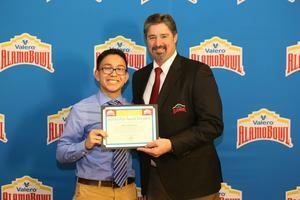 Cole Student Wins Alamo Bowl Scholarship! Kyle Villanueva is the recipient of the Valero Alamo Bowl Community Partners scholarship. 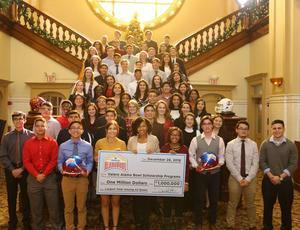 The $7500 scholarship is awarded based on academics, teacher recommendations, a personal narrative, and extra-curricular involvement. Kyle is one of 78 scholarship winners recognized at the Valero Alamo Bowl Student-Athlete Awards Luncheon on December 13. He was recognized on the field during the Valero Alamo Bowl. Kyle was named the cadet of the year in the Cole High School Junior ROTC program. He serves as the National Honor Society treasurer and is a member of the varsity tennis team. After high school, he would like to study biomedical technology at Trinity University or Texas A&M. Congratulations to Kyle!